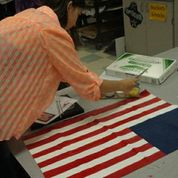 I used acrylic paint on loose canvas to create a flag-like affect because I "combined" the many American flags we have had in the past to create one flag that dipicted all of them. I took a risk because I wasn't sure how the loose canvas would affect the layers of paint and if by the bending it could crack the paint. Every flag we have had is important, and by combining them I hope to maintain that history through only one flag.